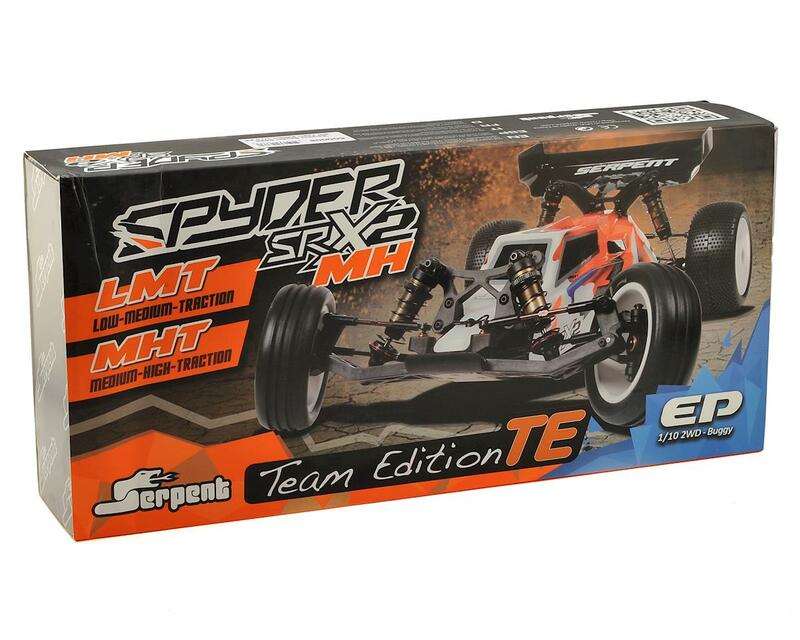 Serpent introduces the Spyder SRX2 1/0 buggy in Team version. The Spyder SRX2 MHT Team edition (medium–high-traction) will perform best at medium to high traction tracks like carpet, astro and high grip clay. Chassis:Hard coated and laser engraved 7075 T6 aluminum chassis plate with a layout allowing for a perfect weight balance, and optimal space for the electronics, battery and servo. The aluminium front kick-up plate is separate and angled for more clearance for racing and allow for better nose landings. ( the separate kick-up plate allows you to also mount the optional carbon chassisplate). Shock Towers: Strong and ultra stiff carbon fibre front and rear shock towers. The shock towers have multiple shock angle positions allowing drivers to fine-tune for varying track conditions. Shocks: Dual system 12mm hard coated big bore shocks with coated threaded bodies, a unique cap design, a superbly sealing o-ring and spacer package. The shocks can be used in bladder or emulsion setups wit the hardcoated shocktops supplied. The shock-set comes with a set of moulded pistons to choose from. 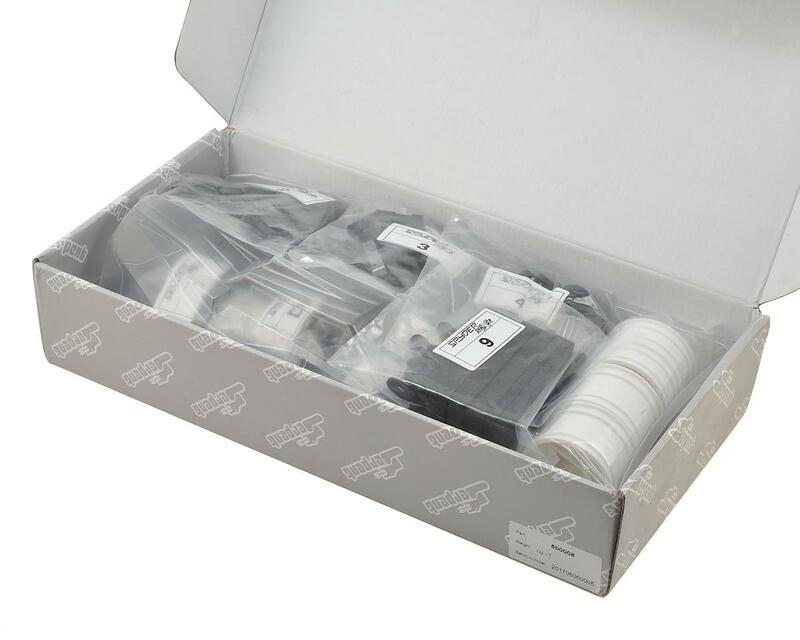 A selection of 5 springs-sets is available to fine-tune the suspension settings. Shock collars with inner o-rings are used on the threaded bodies to set-ride height. The rear shocks can be mounted in front of the rear arms or at the back. Super versatile. Front Wishbones: The wishbones are made from a super strong composite material. The gullwing arms to optimize the CG and pivot on 3mm captured pins on the inside and out. The arms have 2 mounting positions for shock angle and are prepared to use an optional anti-roll bar if needed. Castor Blacks & Settings: Caster block inserts come as 0, 2.5 and 5 degree version all of which are included. The caster blocks are very compact and strong units made from a special composite material. Ball Differential: The limited slip ball differential is a super compact, effective and durable unit. Utilizing 1.8th inch diff balls for ultimate durability. The structure and assembly is common type in this class, but the high quality parts and well functioning will make it stand out. Slipper Clutch: The durable slipper clutch uses a 3-pad system with long lasting pads, hard anodised aluminium parts and springsteel shaft. The pre-load nut can be easily reached and set. 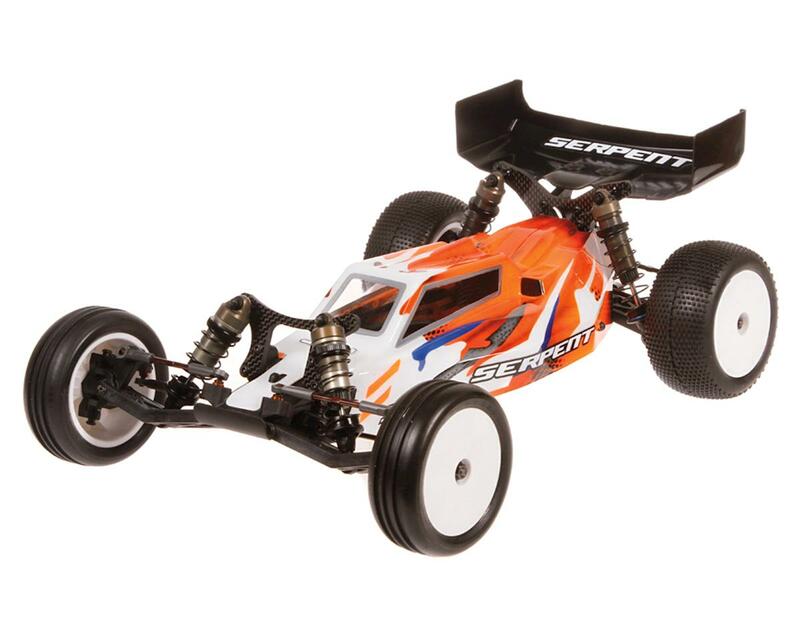 As options, Serpent also offers the 3-gear upright, 4-gear upright and 4-gear laydown transmissions, which are easy to assemble on the same alu chassis. 4 transmissions all fit the same platform. Serpent 2WD buggy kit is incredible. Very happy that I have chosen to switch from the main stream and go with a much higher quality racing buggy. Fit and finish is top notch, adjustability is nearly endless. Parts availability is excellent. These buggies are extremely fast and consistent and have more controlled on power steering than any other brand we have driven. I highly recommend this product without any hesitation. I run on carpet and this buggy has been my favorite so far. Durable, fast easy to drive and something a little different. The designer has been a 2wd World Champion and it shows. Definitely worth your consideration.